When you think of plumbers, you think of leaks. Leaks can be a real pain, but they’re usually not difficult to deal with. They can cause a bit of water damage if not found in time, and they can also drive up your water bill if not found for a really long time. However, what sets some leaks apart from others is where they’re located. A leak underneath your home, for example, is one of the worst kinds you can encounter. It’s called a slab leak, and we’ll cover all aspects of it in today’s post. A slab leak, as stated above, is a leak that forms underneath your home. Specifically, it forms underneath the concrete slabs that make up your home’s foundation. The problem is that the soil above these leaks will begin to absorb the water, causing it to expand. The expansion will push the concrete slabs upward, which can cause serious damage to your home. There are various symptoms of slab leaks. Some of them are common for all leaks, while others are unique to the slab variation. 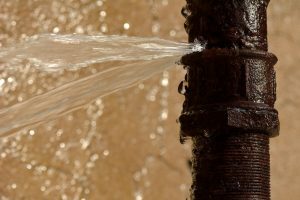 All kinds of leaks will cause water pressure issues. Plumbing uses high pressure to route water to different areas of the home, so a leak will cause the pressure to become lower. The result is a slow trickle when you turn on your faucets, fixtures, and appliances. Since slab leaks are underground, it’s not surprising to hear that they can sometimes go unnoticed for several days, possibly even weeks. If this is the case, you might find an increase in your water bill before you realize you have a leak at all. If your water bill has you suspecting a potential leak, you can do a test by turning off all the water in the home and checking the water meter. If the dial is still moving, it means water is still running somewhere through your system. This is where slab leaks get nasty. If you notice water pooling up around any of these areas, you should call a plumber in Snellville, GA immediately. Hard Floors: Slab leaks can create cracks in tile or concrete flooring, and with it comes the leaking water. Carpeting: It won’t be as easy to see at first, but the same thing can happen underneath carpeted rooms. The dampness can eventually lead to the growth of mildew and mold. The Yard: Slab leaks don’t have to happen directly inside your home. Check the perimeter of your home for areas of grass that are wet and spongy. If the leak hasn’t seeped through the floor, it could be running just beneath it. Depending on which waterline has broken, you might be able to feel a stark difference in temperature when you put your hand to it. Often, warm spots are found when homeowners notice their pets have taken to laying on them. Do you have a slab leak? Contact Snellville Heating, Air and Plumbing today. Your Comfort is OUR Business.